We’ve all met them – people who just can’t or won’t be convinced or dissuaded of something no matter how strong the evidence. Whether they cling to a deeply held personal bias, a conspiracy theory gone viral on the internet, or a belief system that leaves no room for questioning or a different interpretation, they (we?) can be a frustrating lot to deal with. What they had just seen with their own eyes was so incompatible with what they believed to be true, it had to be explained away. 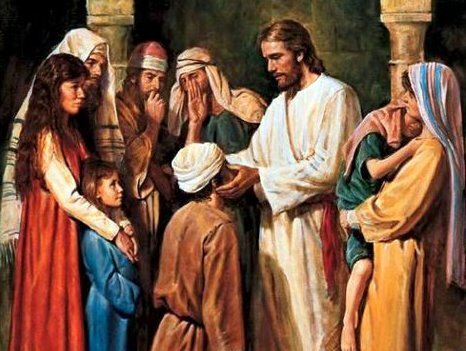 A related theme is presented in the first reading when Samuel assumed that the king of Israel would be chosen from among the seven sons of Jesse who were presented to Samuel. But God had other plans. In this case Samuel was open to the message of the Lord and sent for the youngest son, David, who had not even been brought to the ceremony. It was David, deemed unworthy by everyone else, whom the Lord chose. In what area(s) of your life might you like God to heal any beliefs, attitudes or emotions that inhibit your acceptance of God’s unconditional love? Do you sometimes find yourself judging others as “unworthy” because they do not meet your expectations in some regard? Perhaps you can pray for the grace to see more as God sees. This entry was posted in Liturgical Seasons, Reflections and tagged blind, God's image, gospel, heal, Jesus, Laetare Sunday, Lent, Lenten reflections, rejoice. Bookmark the permalink. I find your reflection to go deep into my heart, to ponder my attitude and to be challenged by the questions. Thanks so much for this Gospel “thoughtfulness”.